If you are able to fully adsorb the fact that a diamond is not an investment, but a retail product that you buy to look nice when placed on your loved one's body, then clarity enhanced diamonds are a great way to save money and get a great looking diamond. Diamond clarity is a function of the number, size, color, and placement of inclusions in the diamond. Since theses inclusions are in essence just cavities filled with different types of materials, you can greatly enhance the clarity of the diamond by reaching those inclusions from the surface and cleaning out the cavity. This is the only type of clarity enhancement that is sanctioned by the GIA. This involves boiling the diamond under deep pressure in a special acidic solution. This procedure only works on diamonds whose inclusions are black and reach the surface. If the inclusion cavity does not reach the outer surface of the finished cut diamond, then the acid has no way of penetrating the inclusion. Likewise, deep boiling does not fill in the cavity, it simply removes the black compound that's filling it. So at best this procedure can remove a very noticeable black inclusion and replace it with a slightly translucent white inclusion. This procedure is so commonplace and cheap that most diamond manufacturers simply deep boil an entire production of diamonds before sorting to be sure they have removed any black inclusions that could be removed. There is no stigma whatsoever attached to this treatment. This procedure is what is done to diamonds whose black inclusions do not reach the surface of the diamond. A microscopic hole is burned with a laser beam from the surface of the diamond to the black inclusion contained within the diamond. Once a passageway has been opened up, then the diamond is deep boiled to remove the black from the inclusion. This procedure will leave a small, but detectably processed "tunnel" inclusion from the surface to the inclusion that was black prior to the procedure (See Figure below). This procedure is not sanctioned by the GIA and must legally be disclosed by anyone selling diamonds treated with laser drilling. This is basically the same as laser drilling, except that instead of burning a tiny "tunnel" from the surface of the diamond to the black inclusion, a microscopically thin plane is burned through the diamond until it reaches the black inclusion. Despite the fact that the ensuing laser created inclusion is larger than the "tunne" left behind by the regular laser drill, its appeal is two-fold. Firstly, for the unscrupulous diamond dealers out there (and there are many), the mark left is much more natural looking and harder to detect. Secondly, the flat plane inclusion is more easily filled (see next item) than the "tunnel" created by a regular laser drill. This procedure involves filling the inclusion cavity with a microscopic amount of a special formula of silicon and other compounds. This procedure works best with clear "feather" type inclusions. These inclusions are generally clean empty cavities that when filled by the special solution become nearly invisible. This procedure is often used in tandem with "Special Laser Drilling" to reach inclusions buried beneath the surface of the diamond. As with deep boiling, you can only "fracture fill" a diamond if the inclusion you want to fill reaches the surface (otherwise, there's no way to inject the inclusion, or "fracture," with the solution). 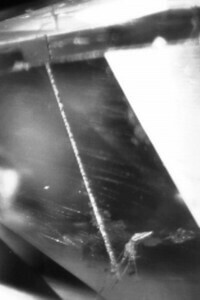 For this reason, diamonds selected for fracture filling are often "special drilled" to open up the buried inclusion to the surface to allow the solution to reach it. Like laser drilling, fracture filling needs to be legally disclosed with any purchase. Furthermore, the GIA will not grade fracture filled diamonds.